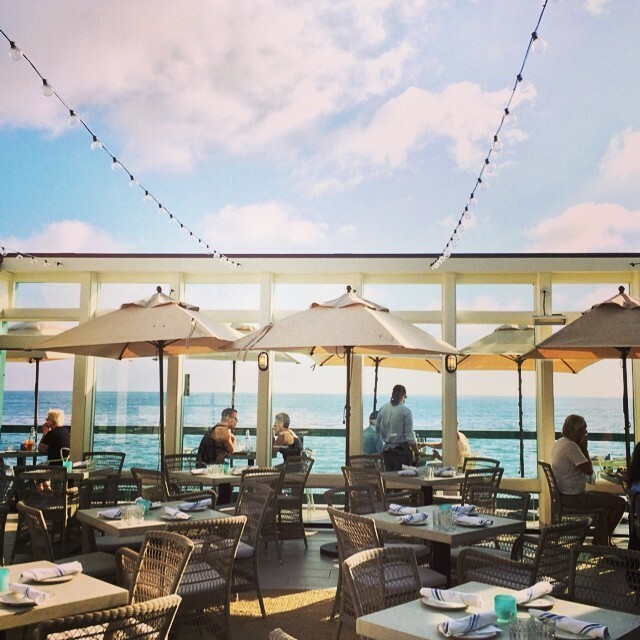 Oceanfront dining never gets old and Driftwood Kitchen in Laguna Beach is one of the rare restaurants in Southern California that is right ON the beach. You will most definitely be awestruck by the view and the spectacular natural ambiance it exudes. Recently, we celebrated our 25th anniversary with a special dinner on the outermost patio of intimate tables for two with nothing more than translucent glass between you and the sand and surf below. Maybe it was the amazing milestone we were commemorating that had me turning extra sentimental, but bear with me as I wax poetic a bit more. Seated at Driftwood Kitchen in Laguna Beach, a feeling of gratitude and wonder fills your heart as you gaze upon the expanse of azure blue that becomes one with the nearly cloudless sky in a spectacular monochromatic Mondrian color block. Any lingering worries are exhaled with each cleansing breath of fresh sea air. Simply allow yourself to let go and revel in the good fortune that has afforded you this moment in this magnificent place. In lesser hands, nature’s stunning scene could very well upstage the food and libations, but not at Driftwood Kitchen, where Executive Chef Rainer Schwarz and veteran restauranteur partners Colby Durnin and John Nye have created a menu that is at once sophisticated but casual, an intriguing wine list that begs you to ask questions, and fascinating handcrafted cocktails that pay homage to the storied heritage of Laguna Beach’s rich history. All combine in a triumvirate that is sure to have you reaching culinary nirvana before days end. To help me get there, I ordered the “High Tide” (above). Truth be told, I remember distinctly the Knob Cobbler that I tasted at the media preview, but the drink has proven so popular that they had run out of the Knob Creek Smoked Maple Bourbon! Not to take anything way from the High Tide – Dickel 8 rye with pineapple and ginger, is also very refreshing and one that I would order again. I’m just more of a bourbon gal who hopes they have tripled their Knob Creek order. Joining us to celebrate 25 years was College Girl, who graduated from UC Santa Cruz in June and is home until she is able to score an entry level job in research or linguistics. So our date night included a third at our tiny table for two and she was there for 23 years of our wedded journey. She chose the “I Can See Clearly Now” cocktail of gin, carrot juice, ginger puree and lemon sour and declared it delicious. And, you feel so healthy drinking it! Executive Chef Rainer Schwarz was born in the small Austrian town of Klagenfurt and began his culinary training at 15 with a four-year apprenticeship at an Austrian castle converted into a restaurant. He then traveled to Switzerland, Germany and France working in various five-star hotels and restaurants. He left Europe to work with Chef Joachim Splichal at Highland Inn in Carmel, and at Los Angeles’ famed Patina & Pinot restaurants. Subsequent ventures included the Mondavi Project, his own restaurant (Cienega), F &B Director at Vail Cascade and, in 2009, returning to L.A. as Executive Chef at The Roosevelt Hotel and launching Public Kitchen & Bar. Chef Rainer’s style of cooking focuses on simplicity by using only the best possible high quality, seasonal ingredients. His cuisine is sophisticated without being fussy – perfect for Orange County where we like our luxe with a casual vibe befitting our locale. He graciously visited us at our table to congratulate us and jovially engaged in conversation and my husband sharing pics of us renewing our vows before Elvis in Las Vegas. 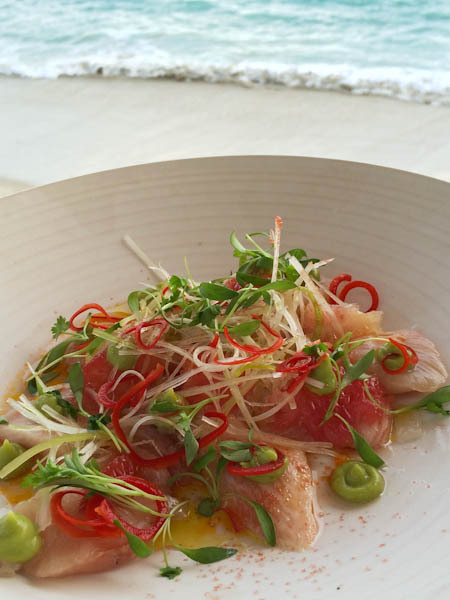 Our first dish was my favorite of the evening – Hamachi Crudo (14.) delicate hamachi, grapefruit, birds eye chiles and Yuzu citrus sauce was supremely fresh, bright citrus flavors balanced by creamy avocado mousse, and a delightful tangle of micro greens, pea shoots and daikon radish providing brilliant color and texture. The Summer Squash Blossoms were divine, and devoured as soon as they hit the table. The lightly battered blossoms stuffed with luscious Bellwether Farms ricotta were light and crispy and perfectly complemented by a chunky heirloom tomato sauce (11.). At the urging of a friend and because grilled octopus can be incredible, I ordered the Octopus “A la Blancha” Taco (14.) with Mexican wild shrimp, huge slivers of pickled radish, jicama slaw, tomato mousse, and tomato-pineapple chutney. The Small Plates are meant to be shared so the tacos are ideal for two. The generous chunks of octopus and shrimp were cooked perfectly – still had a fresh snap, and the accompaniments were a riot of flavors that I wasn’t too crazy about, but mostly because the tortilla became soggy. Sauce on the side for me. Long pause to take photos of the at first subtle, then blazing “Southern lights” sunset. I’m running out of superlatives. Isn’t life grand?! Driftwood Kitchen’s wine list highlights terroir and is organized by region versus sparkling, whites, and reds with familiar names alongside “boutique” selections. I found it confusing, but Manager Josh Buckner says it’s by design to invite questions and give them an opportunity to engage guests in the ideas behind their unique wine program. We enjoy trying new wines from other regions besides California and were delighted with Buckner’s recommendations: a MacPhail Pinot Noir (Napa) and a Fred Loimer “Lois” Grüner Veltliner from Austria. Of the three entrees, the generous portion of crispy-skinned Mary’s Farm Chicken (27) crowned with sautéed sweet breads and served with a rustic panzanella and marcona almonds was outstanding. College Girl, who has quite a sophisticated palate, was beside herself when she realized she had forgotten the to-go box of chicken she hadn’t been able to finish. My husband was happy with the lightly breaded, pan-fried Northern Atlantic Halibut Fillet (28) with a delicate English pea sauce and Weiser Farm fingerling potatoes & corn fricassee. He generally orders fish when we dine out because of his strict low sodium diet. Fish, unlike pork, chicken, and beef dishes, is usually not marinated and sauces can be served on the side. The dish was simple and delicious – well prepared fish accompanied by farmers market fresh vegetables – which suited him just fine. Driftwood Kitchen’s signature dish is the Whole Fried Branzino (27 – serves 1) or Texas Redfish (serves 2-4, $27 per person). So, of course, that’s what I ordered. Branzino is a Mediterranean seabass which I frequently buy at our local farmers market. My first taste of this fish was in Cannes when we were there a few years back, so it was love at first bite and always conjures beautiful memories now. It is a mild flavored white fish, most often served whole because the flesh has a wonderful richness when cooked “on the bone”. If you are squeamish about fish that is served with the head on you should probably order something else. It’s mostly Americans that have an issue with the head – people everywhere else in the world are accustomed to fish being presented in this fashion. The branzino, dusted with mochiko rice flour and fried, is the star and served simply with julienne vegetables, roasted Shishito peppers, and ponzu sauce. It has a rustic appeal and looking out to sea, I could have been in Cannes, if it weren’t for the Shishito peppers. But wait, on this special occasion we weren’t leaving without a little nibble of something sweet, and the two platters presented to us were definitely the pièce de résistance – truly scrumptious works of art! Feast your eyes on the deconstructed carrot cake with cardamom cheese frosting, carrot caramel, and carrot ice cream. Best.Ever. Well, since we’re all chocolate lovers, it was a toss-up with the equally delectable Gluten free Rocky Road with crunch bar, marshmallow sauce, smoky almonds, chocolate ice cream and chocolate sauce! No wonder we forgot the chicken. Not just a dinner, but an experience! Until next time….